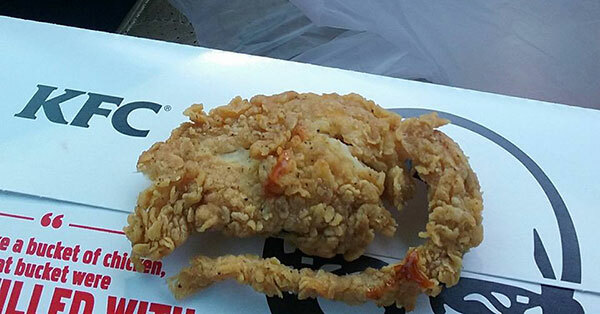 Global chicken restaurant chain KFC has finally issued an official response to a customer's claim that he found a "fried rat" in his meal. In a Facebook post, Devorise Dixon, 25, said he ordered a 3-piece chicken meal from a KFC Compton branch in California on Thursday, June 11. When he bit one of the tenders, Dixon allegedly noticed that its shape looks like a rat with a tail. DON'T EAT FAST FOOD!!! I WENT TO KFC YESTERDAY AND BOUGHT A 3PIECE CHICKEN TENDER. AS I BIT INTO IT I NOTICED THAT IT WAS VERY HARD AND RUBBERY WHICH MADE ME LOOK AT IT. AS I LOOKED DOWN AT IT I NOTICED THAT IT WAS WAS IN A SHAPE OF A RAT WITH A TAIL. IT SENT DEEP CHILLS THROUGHOUT MY WHOLE BODY! I'VE BEEN FEELING WEIRD EVER SINCE. I BOUGHT THIS IN COMPTON, CA ON WILMINGTON AND 120TH. I'VE NEVER SEEN CHICKEN LIKE THIS BEFORE ITS SICK!!! As of 1 p.m. today, his post was shared more than half-a-million times on different sites. On June 12, Dixon claimed that he went back to KFC and spoke to the manager about his complain. Reports online said the fastfood chain made several attempts to contact the complainant and offer him to send the piece of chicken to an independent laboratory for testing, the expenses of which to be shouldered by the company. Dixon, however, reportedly refused to turn over the "fried rat" and talk to them or through a lawyer. 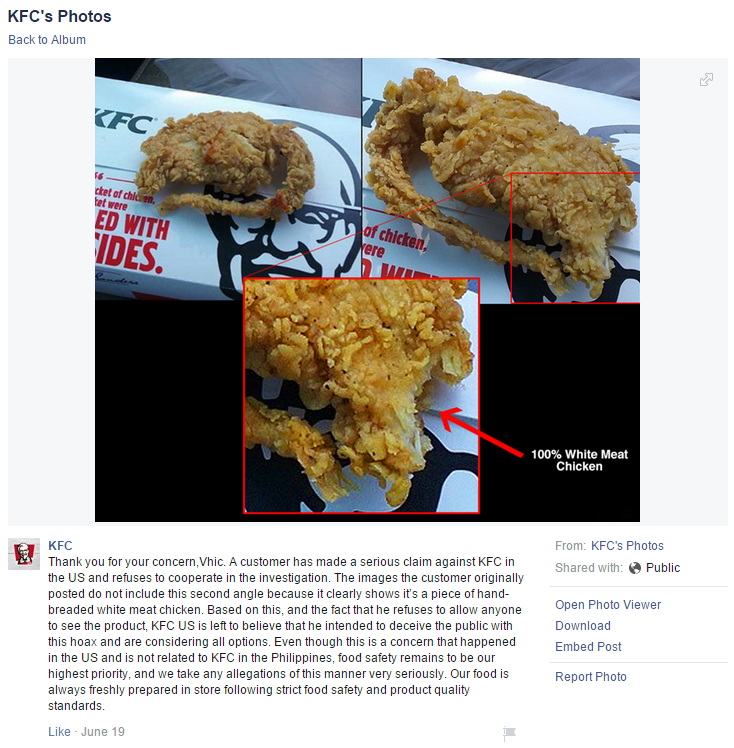 A source, who used to work at KFC, provided Coolbuster.net via private message on Facebook a screenshot of a message forwarded to him by a KFC restaurant general manager (RGM). A customer has made a serious claim against KFC in the US and refuses to cooperate in the investigation. The images the customer originally posted do not include this second angle because it clearly shows it’s a piece of hand-breaded white meat chicken. Based on this, and the fact that he refuses to allow anyone to see the product, KFC US is left to believe that he intended to deceive the public with this hoax and are considering all options. Even though this is a concern that happened in the US and is not related to KFC in the Philippines, food safety remains to be our highest priority, and we take any allegations of this manner very seriously. Our food is always freshly prepared in store following strict food safety and product quality standards. KFC has been confident all along that the customer’s meal was chicken, and now his own photos prove this was just a hoax. The photos show where he took a bite, and it is clearly a piece of chicken-- and not a rat as he has claimed. At least both sides of the story have been presented. Now it's up to the customers to decide.